A lot of things have been happening around here from the new puppy to the kitties coming back home to getting ready to go on vacation and it’s been nuts. NUTS! Approximately every 30 minutes I take Miss Thing, a.k.a. Carly the Gordita, outside. It’s like a part-time job! But if I don’t I’m cleaning pee on my now rug-less tile floors every 30 minutes. But before the puppy came I just had 2 of my kitties back and I was so pleased! Miss Marla once again gave me a kitty to pet every night as I fall asleep and I have to tell you, I sleep so much better with her near me. A few days before we were set to get Carly I had an epic cleaning freakout and decided that I needed to clean everything NOW! It didn’t matter that I had work to do I just turned my computer off and busted out my cleaning caddy. Yes, I actually do have a cleaning caddy. I’m telling you I mean bid-ness when this house gets dirty! 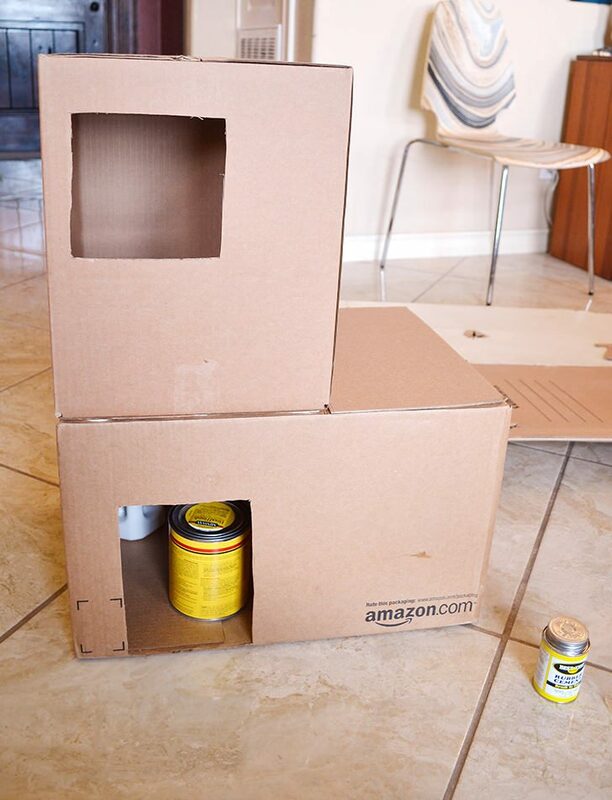 But as I started moving the pile of Amazon Prime boxes that built up from buying only essential stuff like, you know, Keds and food dehydrators and wicker bicycle baskets and wooden looms that are still in the original packaging. Just every day things, amIright? Now this one I wanted to look more like a house than the others I had made so that meant a pitched roof and “siding”. In the end I spent TWO DAYs on this thing :) One making it and the next painting it. Now I stink at painting and that’s why it took me so long to be happy with what I had done but still. 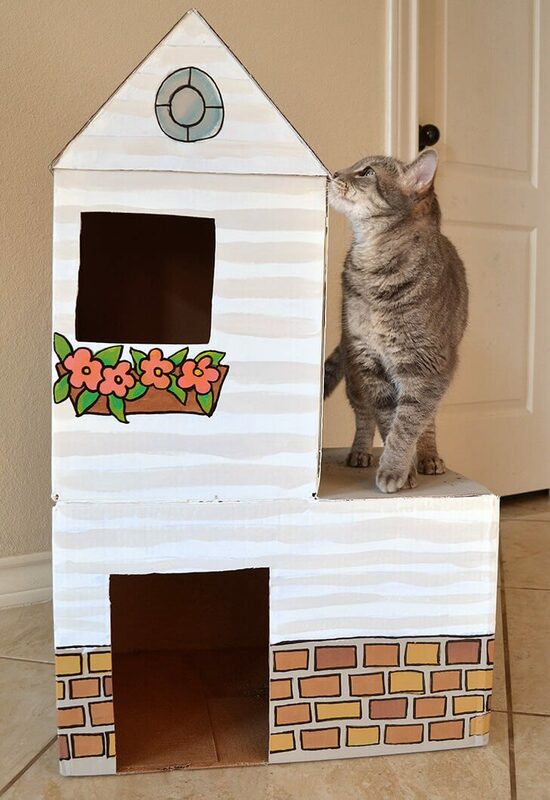 That’s a lot of time for a cardboard house for cats to lay around in! 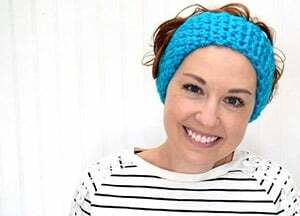 I didn’t put my craft blogger hat on until after I’d already gotten knee deep in this business, but luckily it’s easy enough to catch you up to this point. 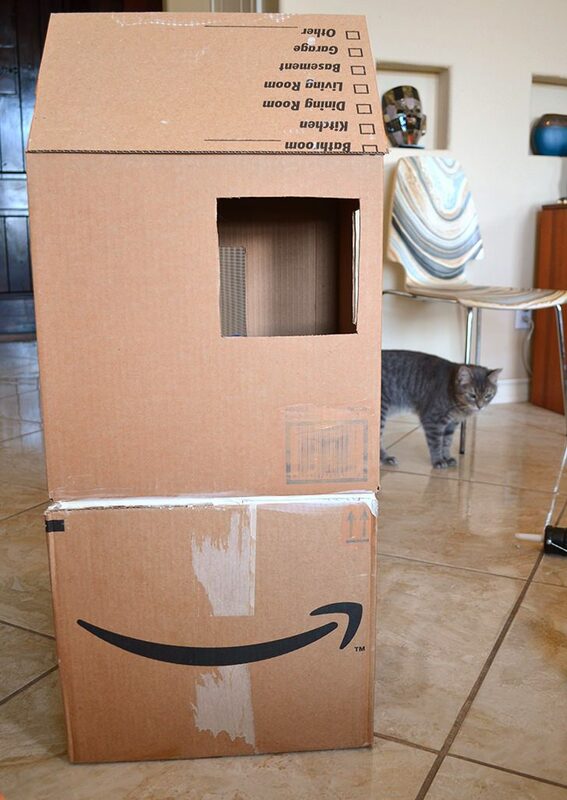 Take your boxes and remove tape and stickers and all of that business. Kind of work out your floor plan now. I wanted 2 boxes, one on top of the other but use as many a s you’d like. 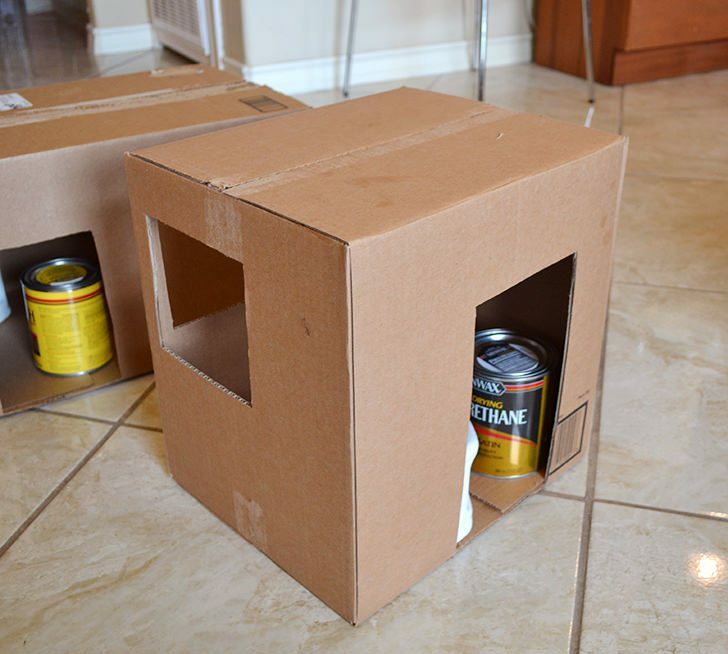 You can make openings in the tops of the bottom boxes and in the bottoms of the top boxes to make inside passageways or you can just make doors on the outside like I did. Glue the box tops shut using something strong. I used Best Test Rubber cement dry mounting because NOTHING is going to make that business come apart. 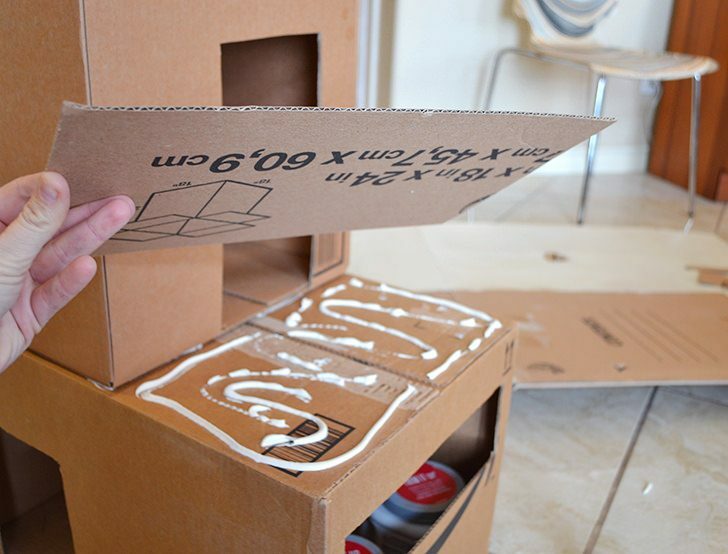 Put weights in the boxes to ensure that the glue grabs hold all around. 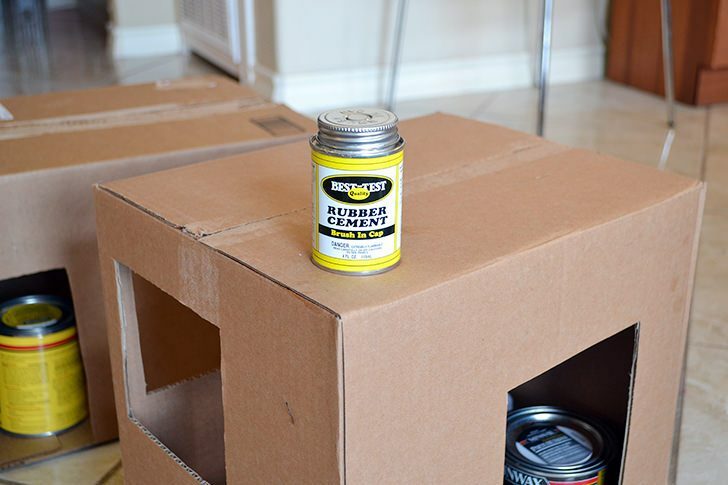 Rubber cement the bottom closed and add weights through the doors and windows to seal down. Now I busted out the serious business. Having this left over it seemed the perfect thing to use. My Mimmie uses it on EVERYTHING and it very rarely fails her. “I just don’t know why that bar stool fell apart under your body weight? 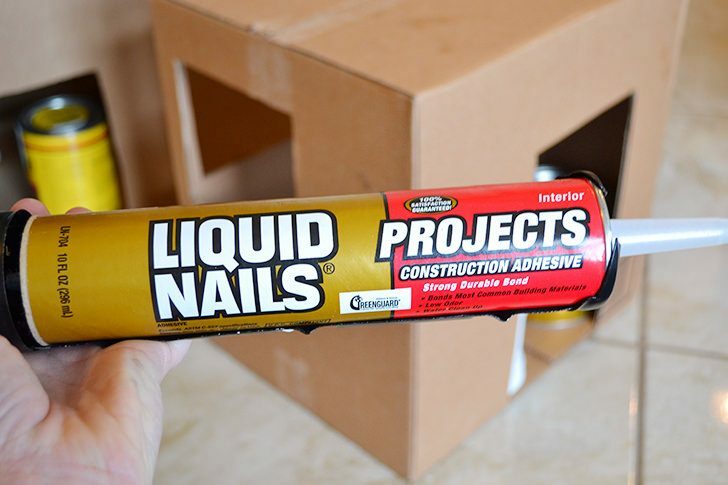 I used Liquid Nails!” :) Seriously – this is some strong bid-ness. 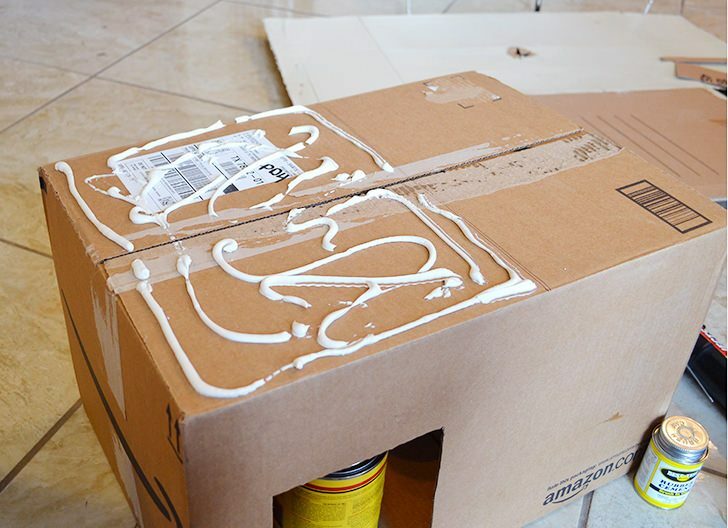 You’ll need to use a caulking gun to pipe the glue onto the top of the box to connect your 2 boxes together. Just set one on top of the other and allow to dry. 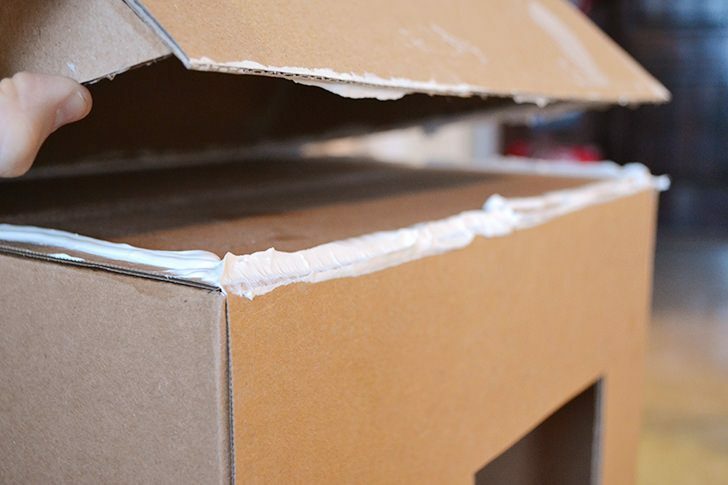 Cut pieces of smooth cardboard can be used to cover any seams that might be visible on box tops. A pitched roof is easy enough to make. 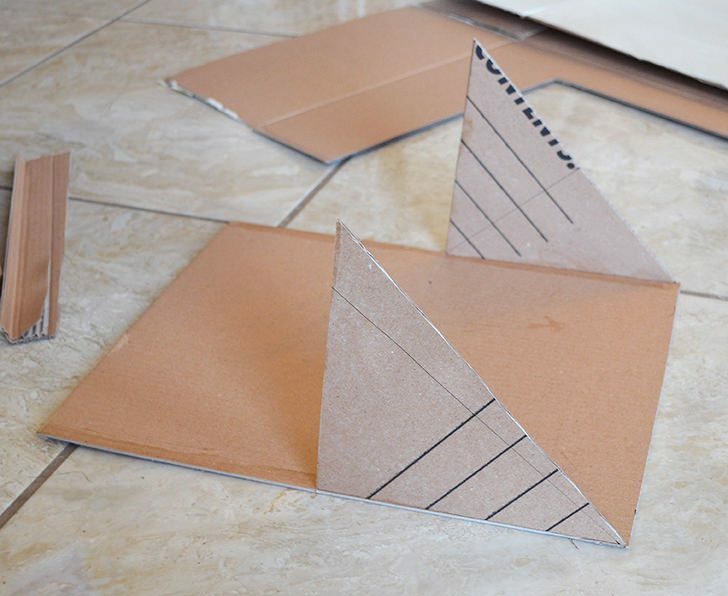 Make 2 triangles (like the ones in the pic above) that are the same width as your top box on the side you want the triangle to show. 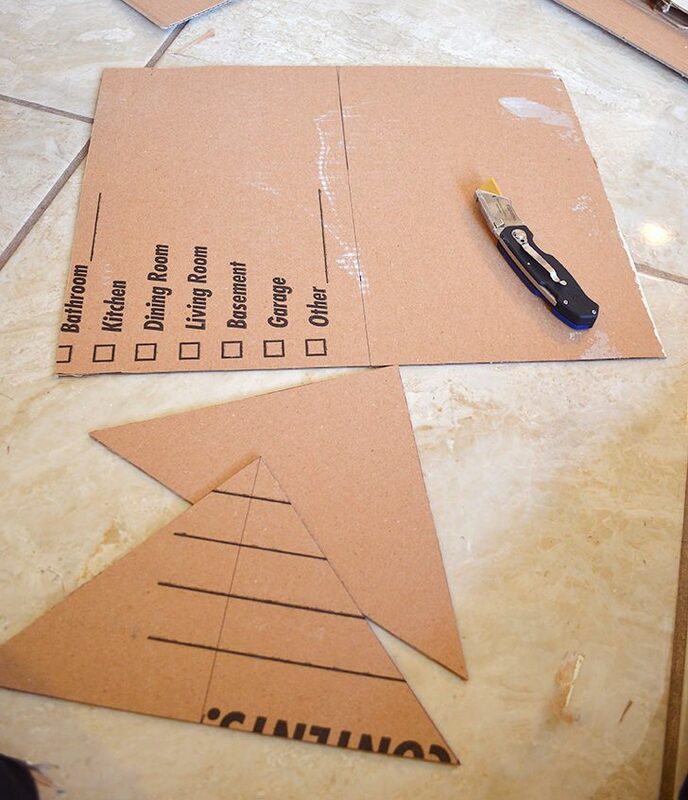 Measure the length of both the left and right angle of the triangle and cut a piece of cardboard that length. You’ll want that piece to be as wide as your top box (on the side where you want the shingles). Dang I hope that makes sense. I don’t think it does but maybe the picture can help you along with this little bit! Along the center of your roof piece you just cut despite my confusing instruction, make a very shallow cut through just the top part of the cardboard to score it. 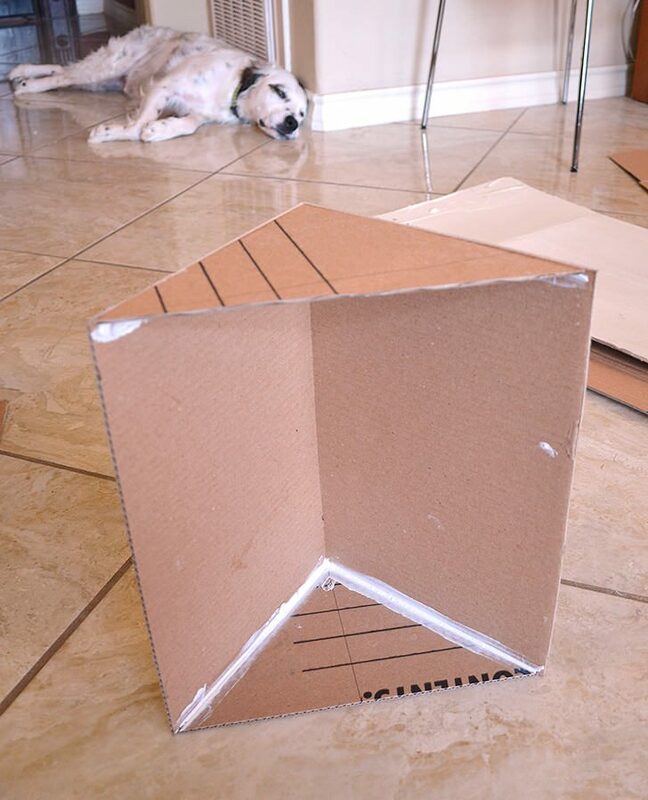 Now it will easily bend into the angle for your roof. Glue the triangles to one side of the roof and let sit a moment for the glue to set (I used rubber cement for this first part). 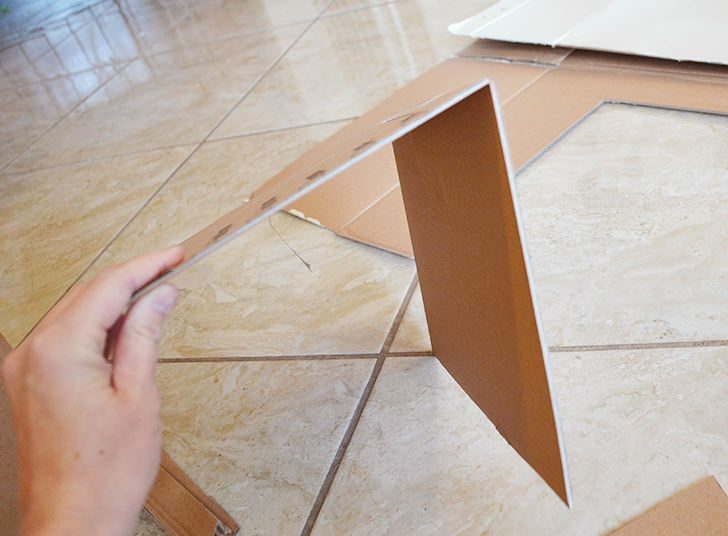 Bring the other side and glue down and reinforce inside with strong glue in the corners. Allow to fully dry. Run strong adhesive around the top box that needs the roof. Place the roof piece on top and situate as you need it. If using Liquid Nails you can fill in gaps and cracks so they are less noticeable. Also, you might notice that I used a tan colored paint to start to cover up all those fab Amazon Prime markings :) And say hi to Mar! 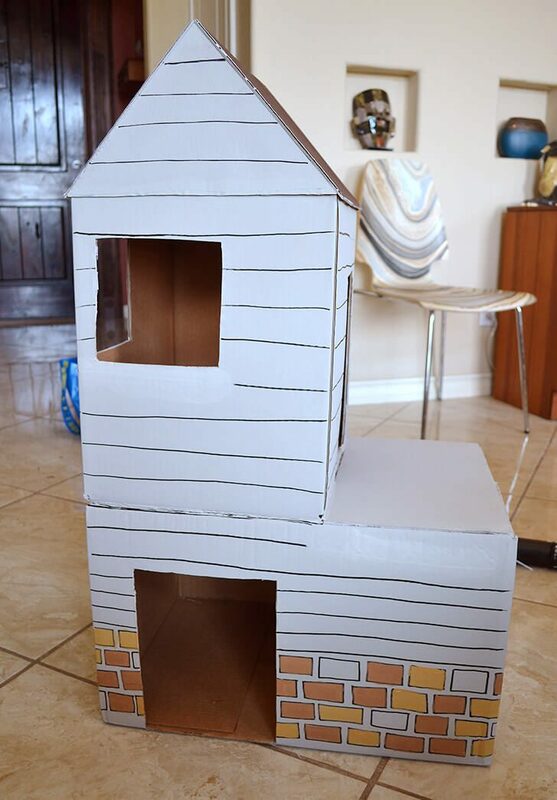 Next day I busted out the chalk paint and acrylic paint markers and set to decorating this puppy. Now I used chalk paint for a very valid reason… it covers everything SO WELL! You can see where I drew my line all wonky for the siding at the top of the bottom box and I swiped a bit of gray paint across that mark to cover it up so I could start again nice and fresh. Boom! Mistakes are no big thing! The roof, though you can’t see it in the pics I took, is brown with scallops painted on for shingles and I later added a little round window painted on to the pitch of the roof on the front because it looked too bare. 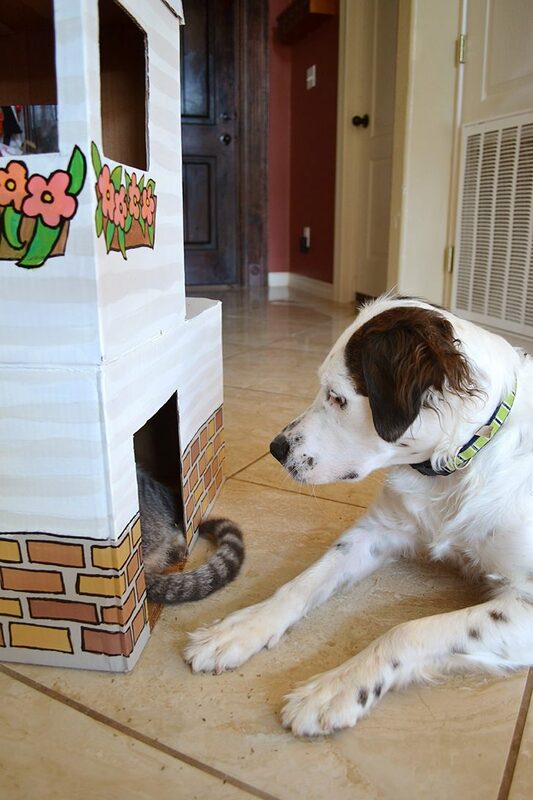 A little bit of catnip and Marla was convinced to move in! And Ollie wanted in on that action but he was too big to be anything but a front yard house guest! 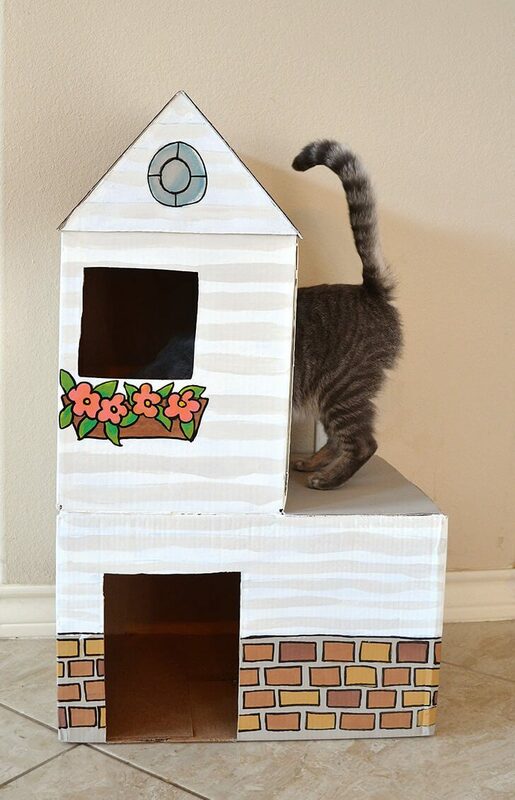 Now because of ADD and my addiction to Amazon Prime, the kitties have a lovely little house to call home within the house they call home. Does it make me nuts that I worked 2 days on this thing? Probably. Do I care? 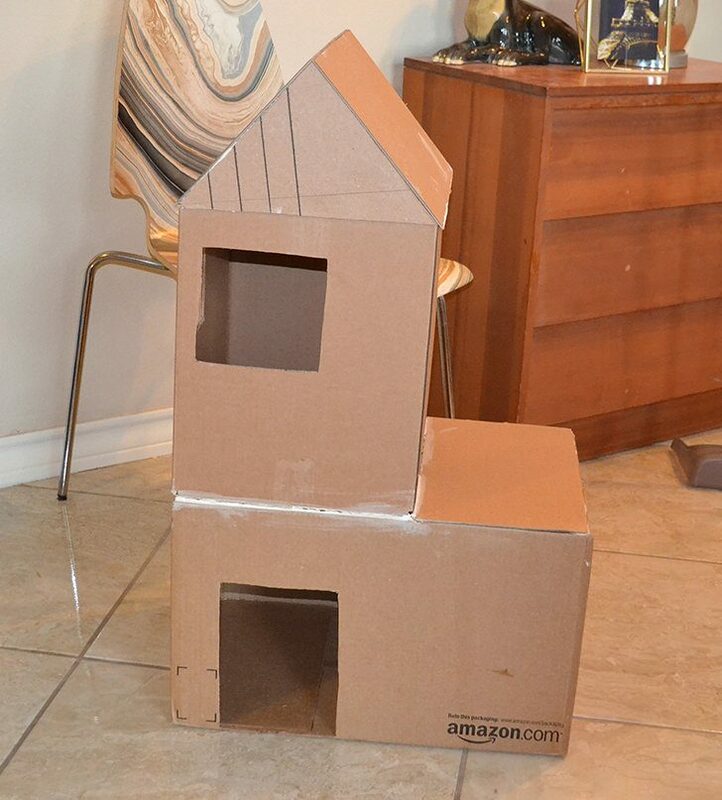 Nope… floor plans have already begun for the next cardboard cat mansion. Watch for it! This is so cool! 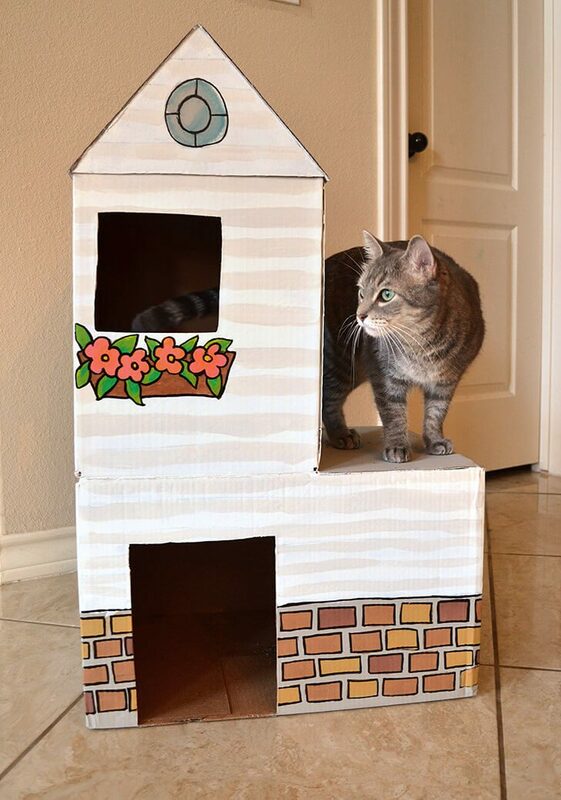 I wish I had a cat to make one. Genius idea! The one I have is FABULOUS. It’s been fruit snacks and tons of beef jerky. I’m sharing my recipe for beef jerky next week and I’ll share all the deets on the machine that I got after trying out my dad’s!